We are now within two months of what may be the most dangerous moment of humanity since the Cuban missile crisis . There is no excuse for not acting . All the resources we can muster species should focus on the fuel pool at Fukushima Unit 4 . Some 400 tons of fuel in the tank could spit over 15,000 times more radiation than what was released at Hiroshima in 1945. The only thing certain about this crisis is that TEPCO has not scientific knowledge , technical or financial resources to cope. No more than the Japanese government. The situation requires a coordinated top scientists and engineers that our human species is capable of providing global effort. We already know that thousands of tons of highly contaminated water is discharged through the Fukushima site , providing a continuous flow of toxic long-term isotope in the Pacific. Tuna irradiated easily traceable to Fukushima fallout has been caught off the coast of California. We can expect much worse . TEPCO continues to pour more water on the near three melted reactor cores site, it must somehow keep the heat under contrôle.Les fumes steam indicate that fission can always go somewhere underground . But no one knows exactly where these nuclei are in reality. Much of the irradiated water is now sitting in about a thousand huge but fragile that were quickly assembled and tanks scattered around the site . Many are already fleeing . Everything could break down in the next earthquake , releasing thousands of tons of permanent poisons in the Pacific. Water flowing through the site also undermines the residual structures of Fukushima , including supporting the fuel pool in Unit 4 . More than 6,000 fuel assemblies now sit in a communal pool just 50 meters from the unit four . Some contain plutonium. The pool is not in containment above . It is vulnerable to the loss of coolant, the collapse of a nearby building , another earthquake , tsunami and another plus. 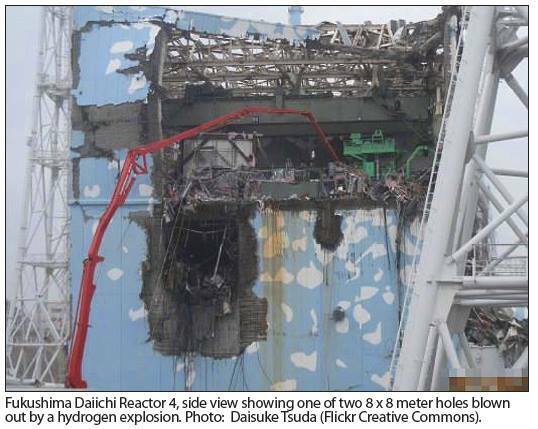 In total , more than 11,000 fuel assemblies are scattered around the Fukushima site . According to the expert and longtime former Department of Energy official Robert Alvarez, there is 85 times more deadly cesium reserves in place as it was released at Chernobyl. Radioactive Hotspots continue to be found around Japan . There are indications of increased damage the thyroid local children rate . The bottom line immediately : the fuel rods must somehow be removed safely out of the four Unit ( fuel pool ) as soon as possible. Just before the earthquake of 11 March 2011 and the tsunami that smashed the Fukushima site , the core unit four was removed for routine maintenance and refueling . As a twenty reactors in the United States and as many others around the world, General Electric designed pool in which the nucleus is now , is 100 feet in the air . Spent fuel must somehow be kept under water. It is clad in zirconium alloy which can ignite spontaneously when exposed to air. Long used in flash bulbs for cameras , burns and flames zirconium with a hot flame are extremely bright and powerful . Each discovery rod emits enough radiation to kill someone standing nearby in a few minutes . A fire could force all staff to leave the site and make impassable electronic machines. According to Arnie Gundersen , a nuclear engineer with forty years of experience in an industry which has manufactured fuel rods , those of the heart of the unit 4 are bent , damaged and weakened to the point of collapse. Cameras showed alarming amounts of debris in the fuel pool , which itself is damaged. Engineers and scientists note that barriers to overcome in order to drain the pool of Unit 4 of its fuel are unique and daunting , said Gundersen . But it must be done with 100% perfection. If the attempt fails , the rods can be exposed to air and catch fire , releasing horrible amounts of radiation into the atmosphere. The pool could come crashing to the ground , could come into fission and explode dumping bars taken together in a pile. The radioactive cloud that would result would be enough to threaten the health and safety of all mankind . The first fallout from Chernobyl in 1986 had reached California within ten days. Those of Fukushima in 2011 arrived in less than a week. A new fuel fire in Unit 4 pour out a steady stream of deadly radioactive poisons for centuries. Neither Tokyo Electric or the Japanese government can go alone. There is no excuse for refusing to deploy anything less than a coordinated team of top scientists and engineers in the world. For now, we are starting a petition to the United Nations and President Obama to mobilize the international scientific and engineering community to support the work in Fukushima and moving the fuel rods to safety. If you have a better idea, please , please forward . But we must do something and do it now . The clock is ticking. The threat of a global nuclear catastrophe is painfully close to midnight. ( Sources: Harvey Wasserman … she is the editor of the Columbus Free Press and Free Press , which publishes the free newspaper Nuke ) . For now, we are starting a petition to the United Nations and President Obama to mobilize the international scientific and engineering community to support the work in Fukushima and moving the fuel rods safely. large scale neutralizing agent, or HF (high frequency) containment. then NO MORE NUKE!!! find a better, safer way. Hello is it possible to get some more sources on how this article was researched and written? I would love to share this information widely! But I need to make sure of its sources. Please and thank you!